Meagan has built a brand of injecting business transformation that positively impacts clients, associates, and shareholders. Her approach to change management, Lean Six Sigma and technology advocacy create a synthesis that delivers immediate results for all stakeholders. Having received Lean Six Sigma Black Belt certification from General Electric early in her career, she added project and change management and emerging technologies to evolve her application of the toolset. She has led operational excellence in a variety of manufacturing environments from heavy metal to chemical. 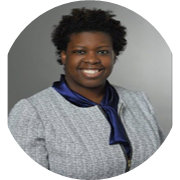 In her current role as the Sr. Director of Business Transformation for ADP, National Account Services, she leverages her expertise to bring innovation, harness the voice of clients and associates, and deliver bottom line results to the leader in Human Capital Management. Check out the incredible speaker line-up to see who will be joining Meagan.